Your teeth are the result of a fascinating evolutionary process which has given you teeth that can bear the enormous loads of chewing your food, as well as keeping out infective organisms in an environment rich in nutrients. The bad news – if you don’t like dentures – is that once you have reached middle age your teeth have fulfilled their evolutionary purpose – they have not evolved to survive much beyond 50 years and of course we are living much longer these days. We can do much in the way of hygiene and care to extend the life of our teeth, but we cannot change nature! 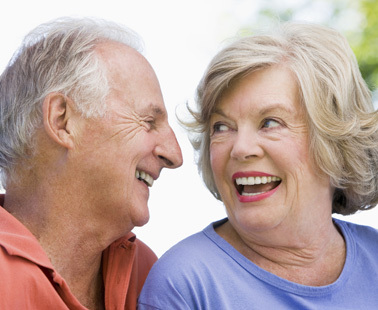 Discuss dental implant costs and treatment options with Dr Sandra Short – call 0753 027 016. In the latter part of the 20th century it was found that bone “loves” titanium, responding to contact with it by growing around it – dentists call it ‘integration’. Soon, dentists were starting to use titanium implants, inserted into the patient’s bone, for supporting “false” teeth. A thrilling alternative to replacing missing teeth with wobbly dentures was born. Implant dentistry is a complex, ever-evolving field. The facial bones show some of the greatest variations in shape and type found in the body. Implant technology has now evolved to give skilled clinicians an implant for every case. Dental implant costs vary greatly according to the case, but an oral examination is all that’s needed for us to give you a clear idea of the options. Dr Short has practised and studied implant dentistry for decades, loves it, and continues her education at every opportunity. In 2010 she brought her expertise in dental impants to Noosa. Whether you are missing a single tooth or are seeking a permanent denture to replace extensively failing teeth, and , a consultation with Dr Sandra Short will provide you with all the options available to restore your bite – and your smile! A quick video guide to the many types of implant. Dr Short takes a look at the factors for long-term implant success. Or fill in our contact form and we will call you.